This cake special make for my colleague birthday.I want to make this cake long time already.I think all people will love it.Because it full of flavor.Chocolate,coffee and banana.Chocolate and coffee always my favorite...hehehe.....So,you know why i choose this cake. 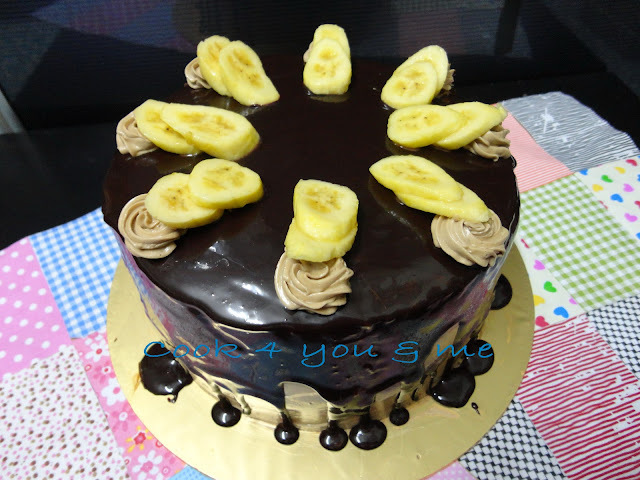 The banana slices become dark after take out from the fridge.I already put lemon juice on the banana before i deco the cake. Place all sponge cake mix ingredients except melted butter or corn oil in a mixing bowl.Beat at high speed for 8-10 minutes or until the batter fluffy. Bake in preheated oven at 180'c for 15 minutes or until skewer inserted into the centre of the cake comes out clean. Let the cake cool down.Once cool,cut into 3 equal layers. Double boil dark cooking chocolate and cream until melted. Set ganache aside covered with cling film. Method and step-step pictures please ref here. Thank you Wendyinkk sharing this Swiss Meringue Buttercream recipe. Slice 2 banana and put some lemon juice on it. Place a layer of sponge cake on a cake platter. 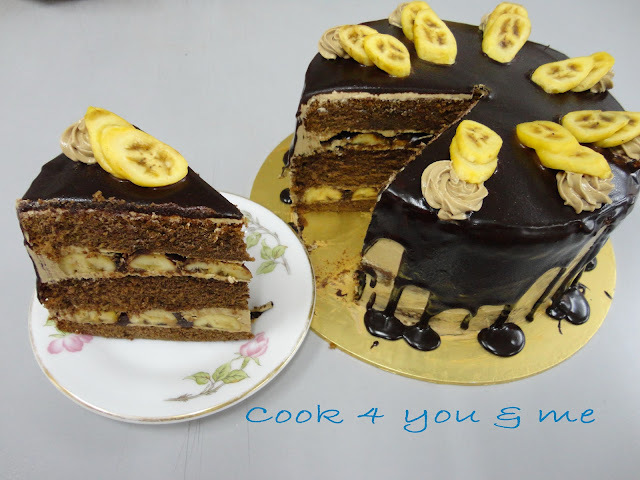 Spread some buttercream over the cake and layer with banana,drizzle some ganache over the banana. Cover with some buttercream before putting another layer of cake. 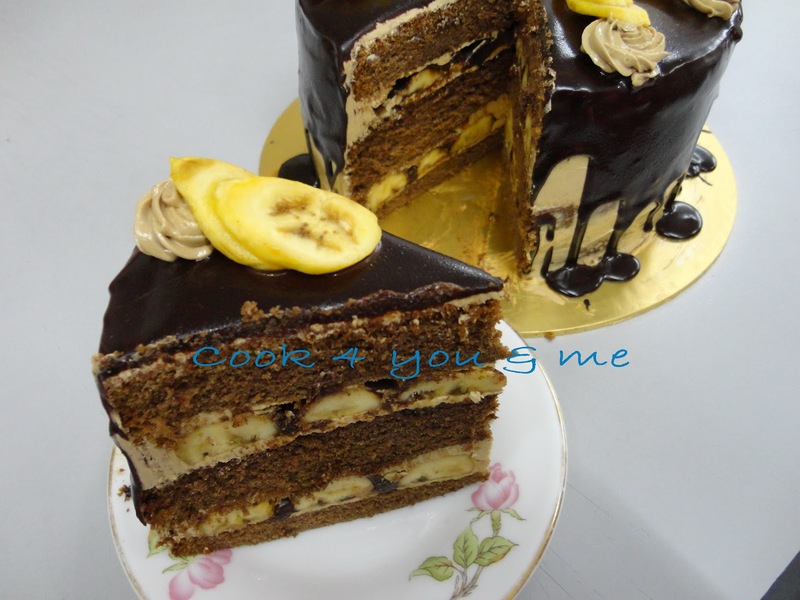 Repeat with another layer of buttercream,banana and ganache then lastly with cake. Cover the whole cake with buttercream.Put in the fridge for 10 minutes. Then put the ganache over the cake and put back in the fridge for another 10 minutes. 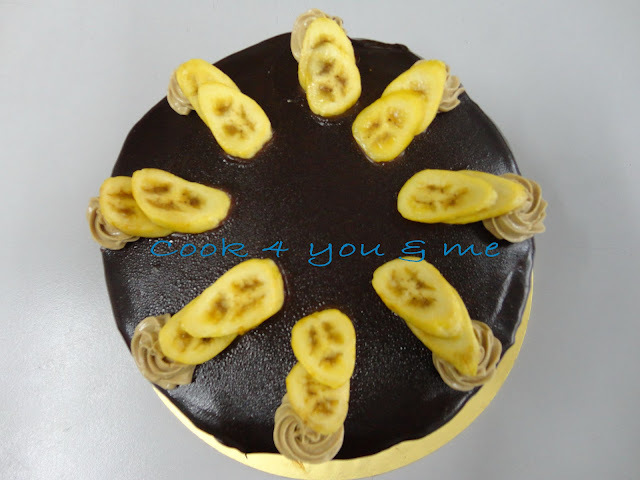 Decorate the top with some rosettes of cream and sliced banana. From the look at it, I believe this cake is real delicious. You done so well and perfecting it. but also lucky you, can make and share the calories! LOL. This looks absolutely mouthwatering! Yum! Thanks for your wonderful entry Hody!! Your cake got lots of "clicks"! 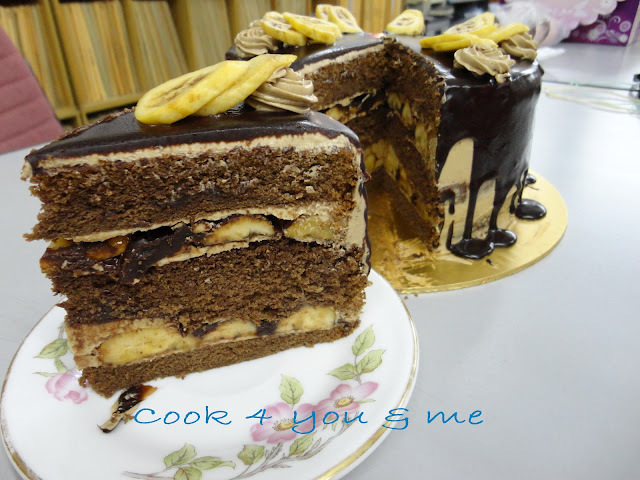 ;) Needless to say, this banana cake is super decadent! new to your space Hody..
this is so luscious! i just had my breakfast but my stomach still have place for a slice of this cake! nice, hody!